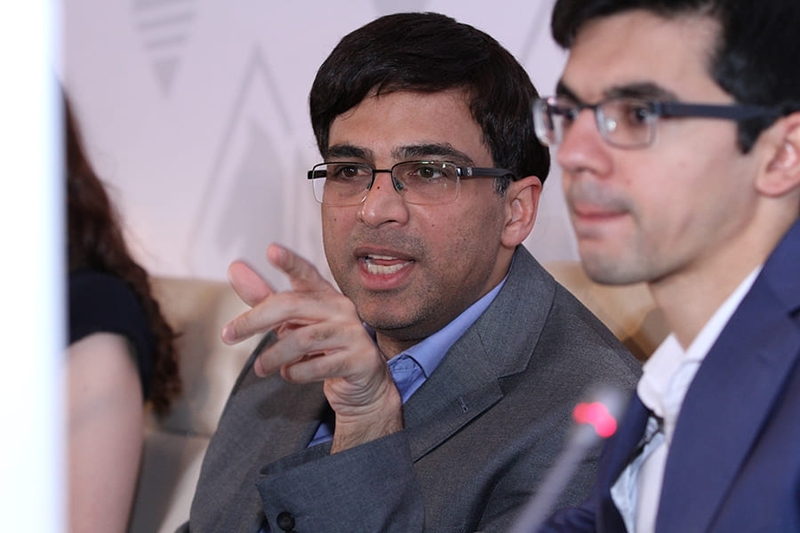 Vishy Anand proved the doubters wrong again to beat Anish Giri in Round 5 in Shamkir – his second Top 5 scalp in the space of three days. 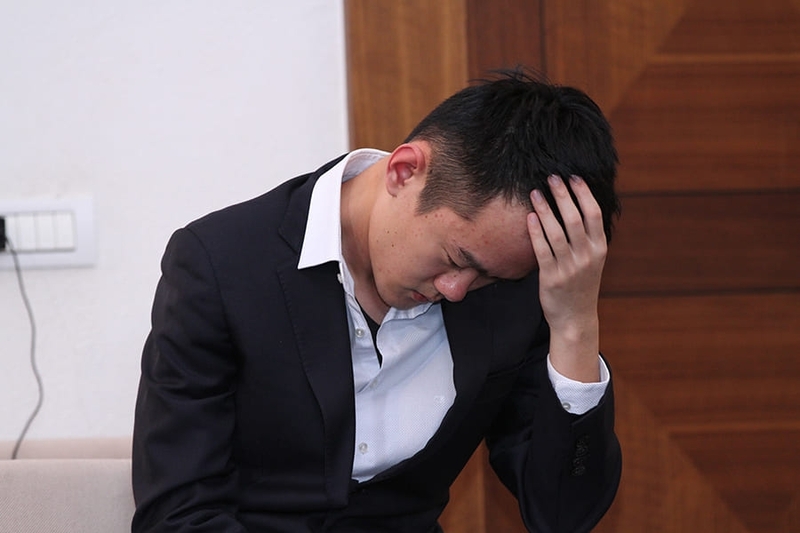 He’s now second and half a point ahead of Ding Liren, after the Chinese no. 1 lost only his second classical game in 129, this time to David Navara. 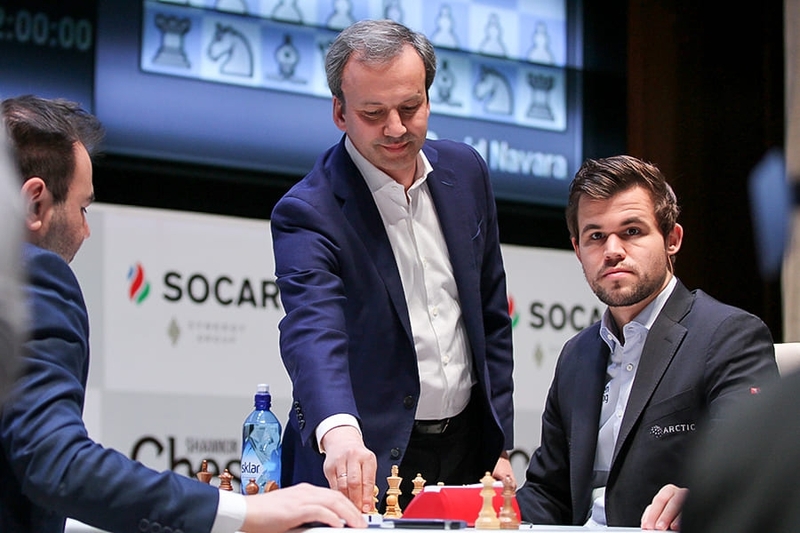 The big clash Carlsen-Mamedyarov was a battling draw, while Alexander Grischuk got the last win of the day, finally using his bishop pair to beat Veselin Topalov after an epic 6.5-hour struggle. “Basically the game shows how weak are humans,” he summed up. 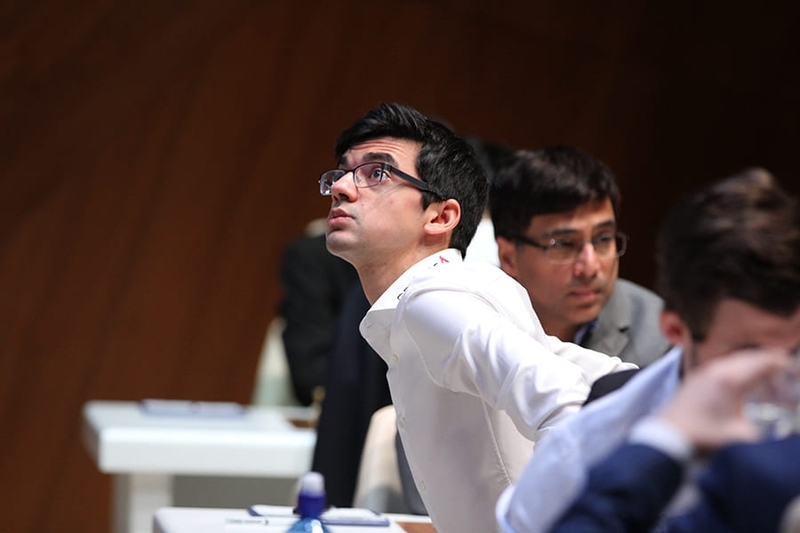 The one game we didn’t mention in the introduction is Radjabov-Karjakin, a Catalan where Teimour managed to surprise Sergey, though not enough to threaten the end of the Azeri’s streak of 22 draws in a row in Shamkir. Karjakin: I also want to finish the tournament. I will go game by game. The other draw, Carlsen-Mamedyarov, finished shortly afterwards, but was a much more vivid encounter. 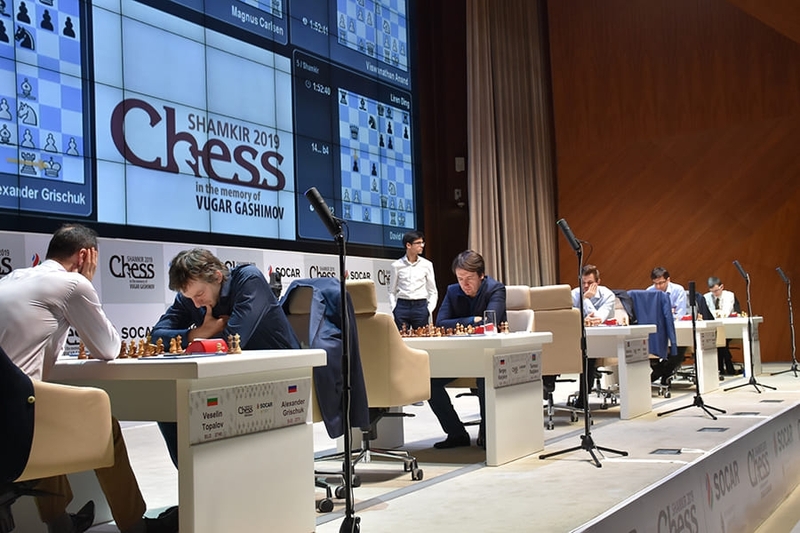 There was a weight of expectation, since this was a clash between the only two players to have won the Gashimov Memorial, with Magnus Carlsen doing it in 2014, 2015 and 2018 and Shakhriyar Mamedyarov in 2016 and 2017. Naiditsch wanted to see the pawn sac 24…g5!? 25.Qxb4, with the g-pawn vacating a square so the queen could swing over to the h-file. It could have been a fascinating fight, though it seems White always has enough compensation, but no more. In the game 24…hxg3 25.hxg3 Ne4! turned out to force simplifications. If White takes the b-pawn 26…Nxg3! would follow, while after 26.Nxe4 Bxe4 27.Bxe4 dxe4 28.Ra5! White had everything covered and the game ended in a repetition on move 37. That meant Magnus dipped below 2850 on the live rating list again, but he remained in clear first in the tournament going into the rest day. Was he satisfied? For me I feel it’s been a bit up and down. The score I think is very good - at least shared lead. Today I was not very happy. The result was ok, but I felt the quality of my play was not very high. So try to regroup on the free day and continue. The score is good, so I cannot complain. The opening is no great shakes. Objectively it’s probably equal because White’s central pawns are compensated for by the bishops, but in practical play it felt much easier to be Black, because with White you have to watch out on many sides. Giri said of said 21.Bc7!, “I blundered this very important move”, which he called, “really huge for White”. Vishy agreed, noting it deprived Black of the d8-square and also freed his d1-rook, since the bishop came to b6 to protect the d4-pawn. Mistakes often come in pairs, and after 21.Rd7 22.Bb6 Bb4?! Giri realised he’d also blundered 23.Ne1! I think Vladdy could have gone on if he’d wanted. With a little less optimism he would have been fine! Here Navara chose the less common 15.Bf4 (15.Rd1 is the main line), and after a 22-minute think Ding Liren opted for 15…h5!? Here Navara went for the powerful line (“it surprisingly works”, he said) 21.Qxa3! Bxa3 22.Rxb6 Bxc1 23.Rc6! (the tactical trick on which this is all based) 23…Bxf4 24.Rc8+ Ke7 25.Rxh8 d3! 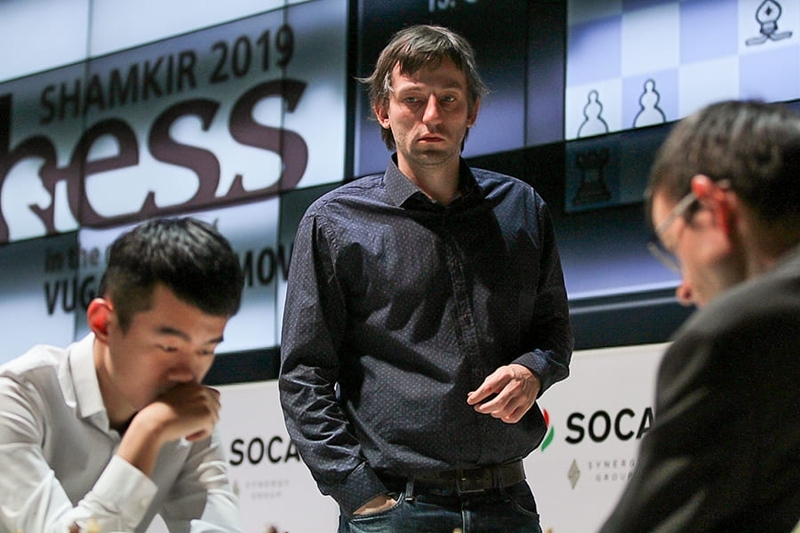 Tactical tricks connected to the d-pawn were keeping Black afloat, at least for now, with Navara feeling it should still have been a relatively easy draw. It's hard to say exactly where things went wrong for Ding after that - 34...Kd6!? instead of 34...Kf8! complicated the defence, while the knight went on a journey from which it would never return. 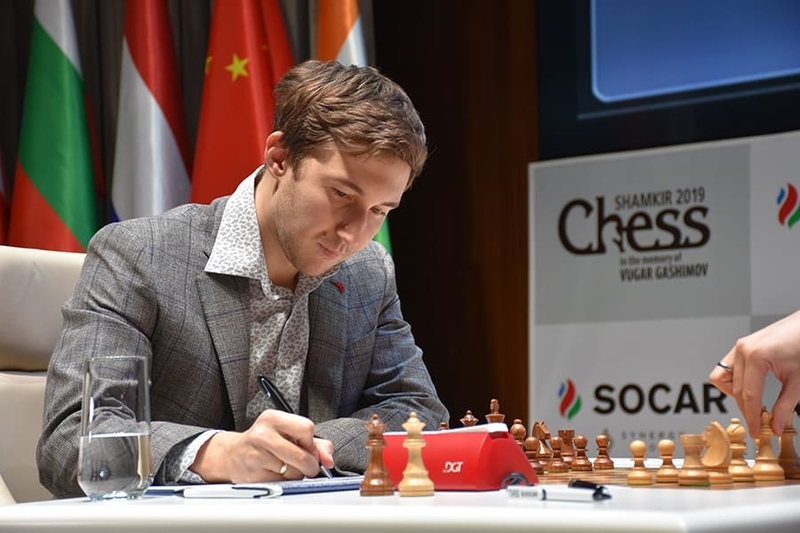 So after falling just short of beating Mamedyarov in a study-like ending the day before, Navara had pulled it off against an even tougher opponent on the very next day! It was doubly impressive, since that was his first victory in Shamkir, after scoring only draws and a run of four losses in a row in 2018. Navara had every reason to be proud of himself, but of course he was downplaying his achievement after the game! I was lucky today because my opponent usually plays better than today, and he missed something. He apologised for interrupting the previous press conference (an interruption so subtle it went unnoticed), and then after taking us through the game in great depth ended, “I apologize for speaking too much!” He remains an unnecessarily modest fan favourite. 40…Nd7? would lose on the spot to 41.b5!, and suddenly the queen has to leave the defence of the e6-pawn. Instead after 40…axb4 41.axb4 h5 42.Qf4 Nd7 Black had avoided the immediate crisis, but was left with two miserable knights against White’s dominant bishop pair. Grischuk correctly assessed that he had a bigger advantage after 43.Ba6! rather than immediately aiming to simplify and win a pawn with 43.Qc7, but it was the start of what would be something of a nightmare for him. He had the impression he was just shuffling around the pieces aimlessly at some point, but if it was tough for White it was at least as tough for Black, and the bishop pair gradually did its job! Alexander concluded, “Basically the game shows how weak are humans…”, but when he recovers from the 6.5 hour ordeal he’ll probably realise he didn’t do so badly! Friday is a rest day and then the players are back for the final four rounds starting Saturday, when Ding Liren-Carlsen looks like the obvious game to watch! Tune in to all the action from 13:00 CET live here on chess24!